Boy howdy, this is one of the strangest comic previews we've ever run. Courtesy of IDW Publishing, here's an exclusive preview of the first issue of Infestation 2: Transformers. 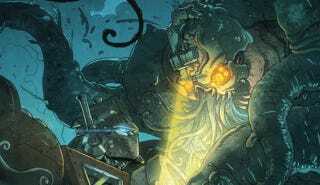 In this seven-page sneak peek, a bunch of Lovecraftian Decepticons in the 1800s rise from the depths to brawl with a group of steampunk Autobots. Riverboat robots versus eldritch, insanity-inducing machines. Your fan fiction prayers have been answered. This comic is part of IDW's overarching Infestation 2 storyline, which ties in with such comics as Teenage Mutant Ninja Turtles, 30 Days of Night, and G.I. Joe. Along with the obvious appeal of H.P. Lovecraftbots, my favorite part of this preview is the charmingly doomed couple minding their own business in the last panel. Hey suckers, you're so boned! The Infestation threat has broken the boundaries of time and the Lovecraftian monsters invade the world of Transformers: Hearts of Steel! It's a steam-punk world in the grips of panic as terrifying beings from the depths of the ocean corrupt both humans and Decepticons! Only one man knows how to stop the Infestation, and it's up to him to awaken the Autobots in time to prevent full-scale cataclysm!